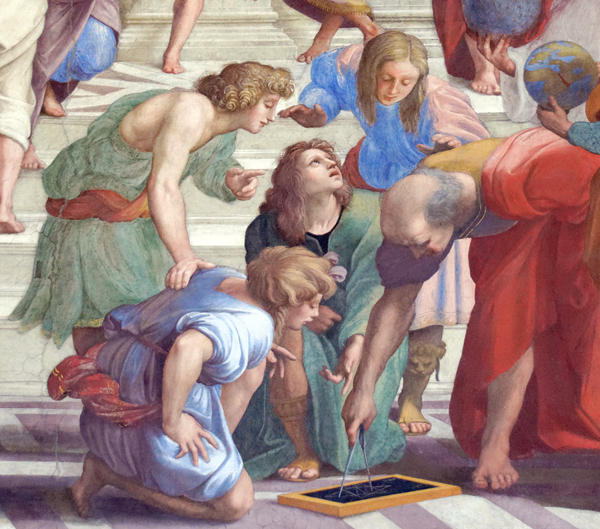 Lower left (kneeling): The young man is engrossed in the unfolding of the theorem’s proof and visual representation. The fingers of his left hand form an enumerated triangle. Upper right: “I think I’ve got it!” This man is following the argument, and expresses his dawning comprehension with the cupped hands facing downward. Perhaps they are even moving slightly in rhythm to express the process of dawning comprehension. Upper left: With his right hand on the back of the man who already comprehends, this man (in green, like his confused friend) proceeds to point out (his left index finger already aimed at Euclid) the solution to the problem. Together, all the figures in this scenario within the School of Athens represent the Renaissance belief that the artist could depict the motions of the mind. As Leon Battista Alberti wrote: "A painted narrative will move the soul of the beholder when each person painted there clearly portrays the movements of his own soul."